The British Royal Family always had a close relationship with the Great Western which began with Queen Victoria making her first ever rail journey from Windsor. Sometimes the occasion was a happy one, for example when the locomotives were driven by monarchs themselves, while other occasions were solemn affairs such as a monarch's last journey from lying in state at Westminster and travelling to their burial at Windsor. Of the 'Castle' class of locomotives, number 4082 appropriately named "Windsor Castle", was chosen as the Royal engine from the time that it was driven from Swindon works to Swindon station by King George V accompanied by Queen Mary on April 28 1924. Plaques were mounted on the side of the cab to commemorate the occasion. 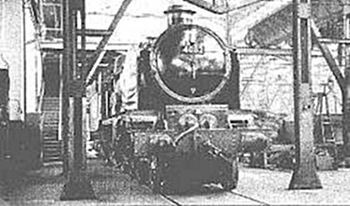 Unfortunately, when King George VI died suddenly in February 1952, number 4082 was in Swindon works for repairs. To keep with tradition, the number of 4082 together with the name of Windsor Castle and the commemorative plaques were transferred to number 7013 Bristol Castle to haul the funeral train. However, after the special train working, only the commemorative plaques were returned to the original engine and from then on number 7013 became the Royal engine, number 4082 Windsor Castle, and the original number 4082 became number 7013 Bristol Castle. Both engines failed to be saved from the cutter's torch: 7013 ( the original 4082 ) was scrapped in September 1964 while number 4082 ( the original 7013 ) worked a little longer until February 1965.